Saw this concert while serving in the RAF at Bruggen (then West Germany), didn�t know much about the band at the time, but wow what a show. I saw the best concert of my life (before or since), music, light show, dry ice effects, what a spectacle. 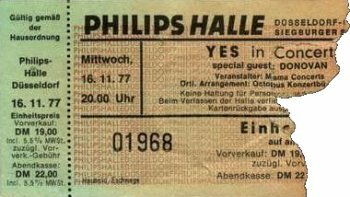 The Philips Halle was a sell out possibly 7000 people packed into the building, seem to remember wafts of sweet smelling cigarette smoke blowing through the air too! All the band members were on top form, I particularly remember Jon�s singing on Close To The Edge with the whole auditorium bathed in green light and I also remember Rick's playing on 'Awaken', columns of dry ice rising into the air at his side of the stage while more ice staying close to floor level at the rest of the stage, all this lit up by various coloured lights, quite moving. Needless to say the concert was well received by the crowd. I remember thinking that I was privileged to have seen such a spectacle, I've seen them many times since over the years but that night stands out for me.